It could be said that Amsterdam holds the key to idyllic laid-back living. From minimalist coffee hangouts to hip boutiques, grand canal houses to some of the world’s greatest artworks, the city is an endless treasure trove of secrets and it’s the perfect size for a weekend break – much to explore but not overwhelming. Amsterdam always has its loyal visitors running (or peddling) back for more. Looking for a few tips? Our city guide will help you make the most of this postcard-perfect destination. When in Amsterdam, pancake-quaffing is the order of the day – so you’d be forgiven for walking into the first pancake shop you’ll find as you amble out of the central station (the sheer number of them will overwhelm you faster than you can say gouda). Hold on to your hotcakes, though, and seek out Pannenkoekenhuis Upstairs: tucked away up a steep set of stairs in a typical Amsterdam-style house, this restaurant is filled with Delftware and old paintings, and offers authentic charm alongside sizeable Dutch pancakes topped with options that range from cheese to Cointreau. It’s no surprise it has been was awarded a TripAdvisor Certificate of Excellence for four years running. Putting charcoal-grilled surf and turf dishes at the top of its menu, this Prinsengracht restaurant is ideal if you can’t quite decide whether you’re after a perfect steak or a lemon cream crab cake. Open daily for both lunch and dinner, it also offers an intriguing cocktail menu and an extensive wine list – so you can while your post-dinner hours away with a drink, either in the stylish and cosy dining room, or out overlooking the canal. We’d recommend visiting for dinner to make the most of the romantic, low-lit interiors. Sweet treat connoisseurs, prepare yourselves for a macaron-hued adventure at this bijou patisserie in the cool De Pijp neighbourhood. Its clean, modest and minimalistic interiors make way for scene-stealing gateaux, pastries, chouquettes and other French delights. Sample the white chocolate cheesecake, grab a selection of petits fours to take away with you, and leave room to indulge in the heavenliest of coffee eclairs – featuring light-as-air choux pastry and a delicate touch of flavour that will soon have you returning for more. Head back to the centre via Gerard Doustraat for some of the area’s best independent boutiques. Indonesia’s Dutch colonial history has certainly left its mark in Amsterdam, and foodies will find quite the unmissable Indonesian and Surinamese culinary scene here. If all that sightseeing has worked up an appetite, you’ll find yourself eager to try rijsttafel (“rice table”), a feast of up to 40 small dishes served with rice. It’s the perfect chance for even the most indecisive foodie to try a rich and diverse array of flavours in one sitting, and can be sampled at Sampurna, where statues and wood carvings fill the dining room with a relaxing and traditional atmosphere. If you’re hoping for international produce, plentiful options and a buzzing atmosphere under one roof, head straight to De Foodhallen on Bellamyplein square. The sheer variety of sweet and savoury food stalls here is set to delight any foodie – dim sum, ice-cream waffles, hot dogs, Iberico ham, and even a seafood and oyster bar are all available on tap, amongst others. You’d not want to miss a chance to sink a few drinks at this buzzing day-to-night hotspot. Try the Wine Bar for international labels, enjoy a refreshing gin and tonic or choose from a large selection of beers. Providing an American-style, healthy and confidently on-trend option for pancake-seekers, MOOK Pancakes on De Clercqstraat is slightly more removed from the city centre yet entirely worth the tram journey. Its white, plant-filled decor offers a restful space within which to enjoy eye-poppingly colourful, fruit and nut-topped, nutritious pancakes. Whether you’re after a sweet or savoury option, this café is a must-try: friendly service comes as standard, as does a complimentary second dollop of syrup – how could anyone say no to that? Whether you’re making a quick stop or looking to kick back and while an hour away, Monks Coffee Roasters on Bilderdijkstraat is a fail-safe pick for a well-deserved shot of caffeine or indulgent smoothie, coupled with fresh breakfast options, sandwiches and salads. Simply decorated and flooded with natural light, it provides an unfussy and contemporary space – perfect for planning the rest of your itinerary as you slow-sip a special house blend espresso or Ethiopian filter coffee. Grab yourself a divine hot chocolate with a serious side of history at this café, housed within the former sacristy of Amsterdam’s oldest building – the 800-year-old Oude Kerk. This red-shuttered and red-brick, cottage-like spot is quite the gem for peace-seekers: tucked away in a popular and very central location, it’s almost hidden from plain sight. Its drinks and pastries are best enjoyed either in the charming courtyard or up on its first floor, styled in a pared-back yet very inviting, vintage retro-inspired decor. Charm and character abound at this 1920s-style speakeasy bar (the first of its kind in The Netherlands), where dark woods, Art Deco interiors, antique barware and elegantly-presented cocktails create an exciting and intimate atmosphere. We aren’t the only ones who’d head straight here for a sophisticated night out – Door 74 has also been listed on World’s Best Bars, so you can rest assured its signature and incredibly creative cocktails will more than meet your expectations. For history with an edgier twist, try this traditionally Dutch “brown café” on Prinsengracht. One of Amsterdam’s oldest, it provides a laid-back setting where jukebox music, refreshing brews and scenic al fresco slow-sipping combine. While located along one of the city’s quieter canalside streets, it’s a small space with al fresco seating, and can be particularly popular amongst locals on sunny days. Those after the capital’s best tea as well as a unique tasting experience should look no further than Formocha Premium Tea House. Here, Chinese tea culture is firmly rooted in a simple and traditionally-inspired setting, complete with handthrown cups, clay teapots, understated decor, and a most serene atmosphere. You’ll find a healthy selection of green, oolong and black teas, as well as jasmine and chrysanthemum blossom, all prepared with precision and lovingly served. If you can’t quite get enough of Amsterdam’s ultra-laid-back atmosphere and are looking for more ways to unwind into the evening, then make a beeline for this shack-style waterfront café where, post-work hours, you’ll find a bustle of locals spilling out onto its outdoor picnic tables to line the water’s edge. Decorated with recycled furniture and offering light snacks and bar food, it’s your go-to for a fun time near Amsterdam Centraal station. Combine your love for paintings, history and admirable architecture with a stop at the Rijksmuseum: ideally located in the heart of Amsterdam’s Museum Quarter, it easily tops the list of any museum-hopper thanks to its seemingly endless collection, spanning the works of Rembrandt, Johannes Vermeer, Frans Hals and many more. Families will relish the guided multimedia tours on hand here, while drawing lessons provide further entertainment for budding artists. Amsterdam’s Canal Ring is perhaps the one architectural wonder you would want to lose yourself in. Built during the Golden Age of the 17th century, this UNESCO World Heritage List member offers more than a chance to snap a few pretty pictures. Fashion boutiques, gift shops and bookstores provide a spot of retail therapy, a wide array of bars and cafés offer respite from all the sightseeing, while canal tours and annual overwater parades – such as the extravagant Gay Pride celebration in the summertime – will give you a chance to see this district from a different angle. Take to the streets in the evening for a more peaceful and picturesque stroll, or if you’re feeling up to it, join the city’s fearless cyclists to tour the area like a local – just remember to take a map along with you. Accomplish a mini bucket list-ticking feat – quite literally – with a visit to the world’s smallest house, located at Oude Hoogstraat 22 in the old city centre. Measuring in at 6 feet 8 inches in width and 16 feet 5 inches in depth, and now housing a tea room, this landmark sight resembles a typical canal house and provides an intriguing slice of history as well as an indulgent slice of cake. If you find yourself thirsting for more fine art masterpieces, cross the road to indulge in a journey through the works of Post-Impressionist painter Vincent Van Gogh, at a dedicated museum showcasing everything from his early pieces straight through to his most celebrated. As well as view a permanent collection of paintings, drawings, letters and memorabilia spread across four floors, you’d have a chance to join a free lecture or partake in a walk-in workshop. Make the most of fine climes at this expansive urban park, spread across 47 hectares. Its location by the city’s museums quarter, which means it’s the best place to end up in for a contemplative wander once you’ve had your cultural fill. You might even find its Tulip Island in bloom, for a chance to pick a few of your own – although true appreciators of the perennial flower should make time for a day trip to Lisse’s Keukenhof, which showcases every variety of tulip under the sun (combined entry and travel passes can easily be found at Schiphol Airport, too, so you’ve little need to plan the trip yourself). Those with a penchant for modern art could never set enough time aside for the eclectic contemporary displays and photography exhibitions at Foam. Located in an old canal house within easy reach of central sights, this small Keizersgracht gem has showcased and honoured the works of internationally-renowned artists – William Eggleston, Helmut Newton and Ai Weiwei, to name a few – as well as hosting debates and educational projects. Set up on opposite ends of the city, on Van Woustraat and Rozengracht, Hutspot’s ultra-sleek decor provides a confident setting for its fashion pieces and special design products, with stocked labels including Samsøe & Samsøe, Elka Rainwear, Monokel Eyewear and more. Inspiring a sense of calm, you’ll be in no rush to leave this haven of contemporary style. Its Van Woustraat branch also houses a barbershop and café – so you’ve little need to look elsewhere if you’re feeling peckish. If you’re after a more complete Delftware experience, head to this iconic museum and shop housed within the Munt Tower, for a chance to discover beautiful one-of-a-kind ceramics, watch a painting demonstration, or even take a workshop before picking up a few pieces to take home – perhaps adding a customised plate to the lot. Green-fingered travellers, rejoice: filled with hanging plants, homeware and other eye-catching bits and bobs, this charming Bilderdijkstraat shop is a true sanctuary for nature and pottery lovers – and it’s certainly worth making a trip out of the city centre for. If you can’t take any plants back home with you, you’ll find plenty of covetable trinkets here and it’s worth the trip just to keep your Instagram grid looking on point. 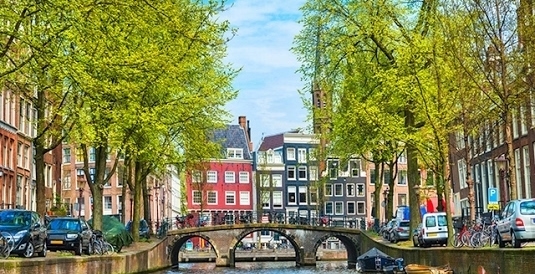 Comprising nine photogenic streets in the city’s Canal Ring, this character-packed spot is ideally placed just moments from the Anne Frank House to one end and the buzzing Bloemenmarkt – the world’s only floating flower market – to the other. Here, you’ll find a fun and eclectic, vintage-meets-designer mix of fashion, art, lifestyle and homeware boutiques (including marvellous antiques store ‘t Runnertje, Dutch-Scandi label AMATØR and leather goods expert RIKA Boutique), the odd chocolate or cheese shop, plus a long list of cafés, eateries and more – from the cosy and rustic-chic Ree7 to wine specialists De Wijnwinkel Renalda. Set amongst vintage shops and fashion boutiques on Reestraat, you’ll find no shortage of adorable homeware, jewellery and accessories here, all screaming for you to take them home. Also a restaurant with a cosy seating area on its first floor, Pluk offers a healthy (yet no less mouthwatering) menu of drinks, fruit bowls, salads, sandwiches, cakes and more, should all that shopping leave you hungry for more. For home decorators and art collectors wanting to grab a piece or two of Delftware, the white and blue tin-glazed earthenware for which The Netherlands is famous, don’t look further than this antique shop. If you’ve a fairly big budget to work with, it offers endless shelves of miniature canalhouses, baubles, plates and other intriguing ornaments. Your inner historian is certain to find happiness at this family-run spot, as its large and authentic collection of Dutch tiles dates as far back as the 1600s.